While the current Rothenberg Political Report ratings don’t show it, I am now expecting a substantial Republican Senate wave in November, with a net gain of at least seven seats. But I wouldn’t be shocked by a larger gain. . . .
Of the seven Romney Democratic seats up this cycle, Montana, South Dakota and West Virginia are gone, and Arkansas and Louisiana look difficult to hold. Alaska and North Carolina, on the other hand, remain very competitive, and Democrats rightly point out that they have a chance to hold both seats. But I’ve witnessed 17 general elections from my perch in D.C., including eight midterms, and I sometimes develop a sense of where the cycle is going before survey data lead me there. Since my expectations constitute little more than an informed guess, I generally keep them to myself. This year is different. I am sharing them with you. After looking at recent national, state and congressional survey data and comparing this election cycle to previous ones, I am currently expecting a sizable Republican Senate wave. . . .
“Americans indicate that these negative attitudes will increase their probability of voting this fall, and history suggests it is more likely that Democrats than Republicans will suffer as a result, given Democratic control of the White House." Of course, there is also Nate Silver giving Republicans a 65.1% probability of taking over the Senate. 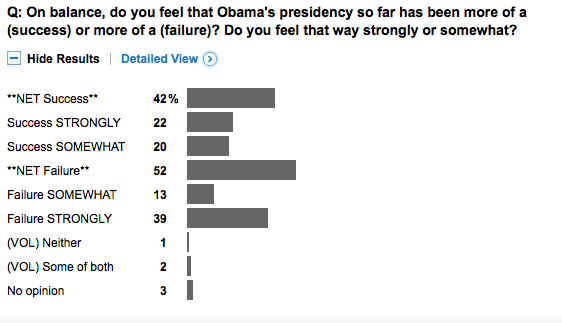 Meanwhile, a new ABC/Washington Post poll shows most Americans view Obama as a "failure." That is a pretty tough way to phrase things. There are a couple of pollsters such as Sabato and Cook who say that there isn't evidence of the wave yet, but Rothenberg's comments deal with that perspective. UPDATE: The Hill has this on the newest NBC News and the Wall Street Journal poll. Republicans hold a two-point lead nationwide on which party registered voters want to see in control of Congress, and that lead expands to 10 points in the Senate battleground states at 50 percent to 40 percent in the poll, conducted by Democratic polling firm Hart Research and Republican pollster Public Opinion Strategies. "With 56 days until Election Day, our poll provides greater insight into what is likely to happen, and the news is not good for the Democrats," Democratic pollster Fred Yang writes in an accompanying memo. . . .